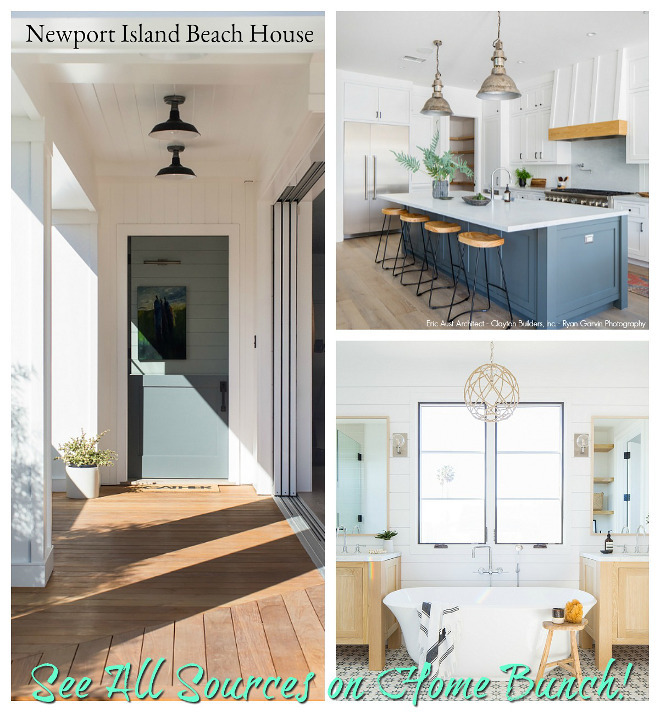 If you’re looking for some home renovation ideas, this home by New Old, LLC, (previously featured here, here & here – you must check these posts!!! ), should be a good start! 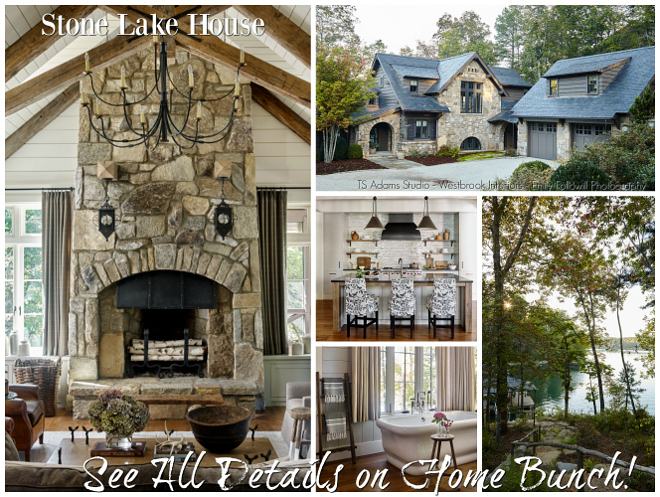 The builder and designer, Mary Ludemann, is well-known for building and designing timeless homes in Fort Mill, South Carolina and it’s no different this time around. 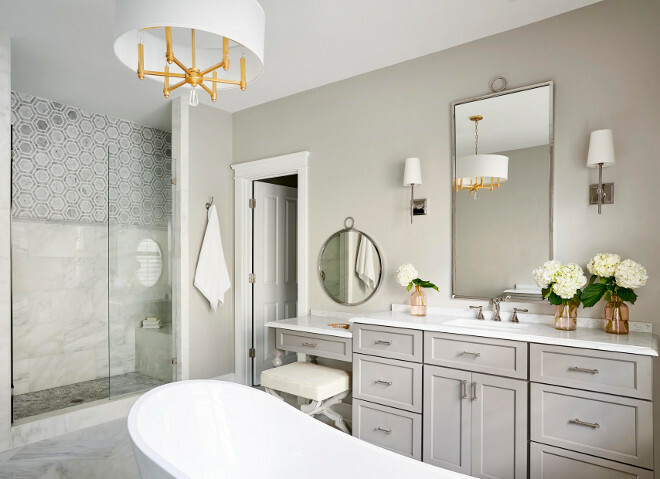 The builder renovated the Keeping Room and Master Bathroom with a welcoming approach that will not only look beautiful for many years to come but also create a space which all of the family members can enjoy. 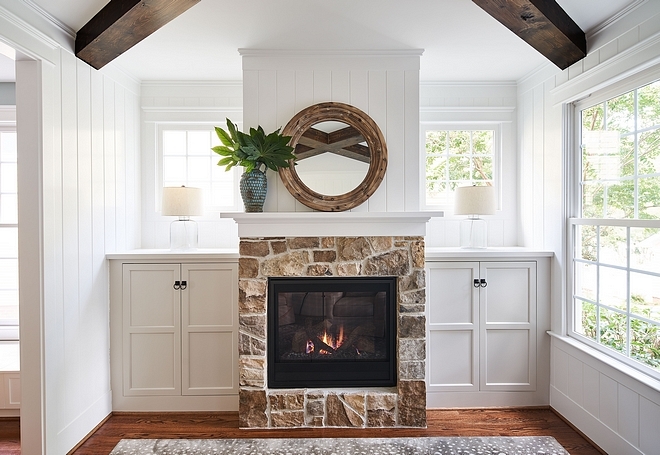 The Keeping room is located just off the kitchen and it features a beautiful fireplace and comfortable furnishings. 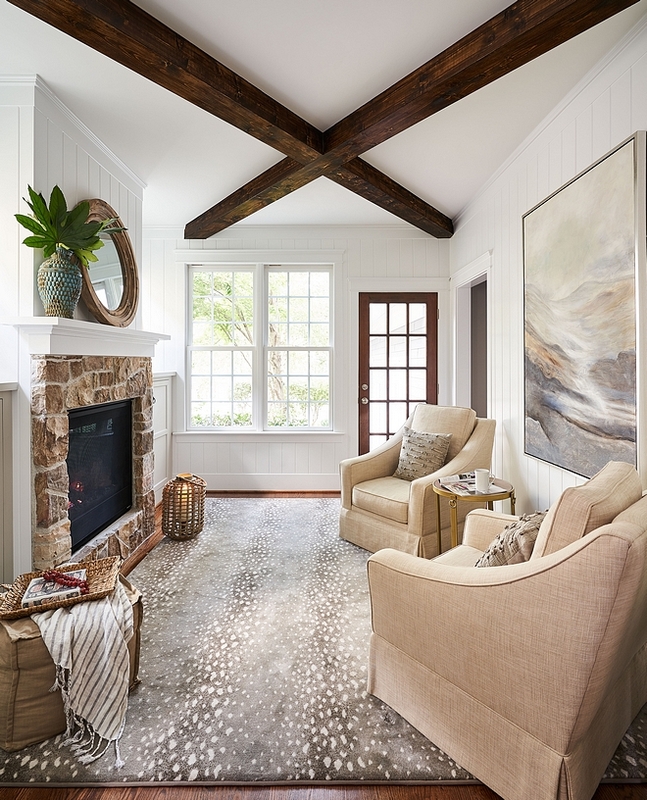 Paint color is a match to existing trim white in a semi-gloss – similar to Benjamin Moore Simply White. Similar Poufs: here & here (small). 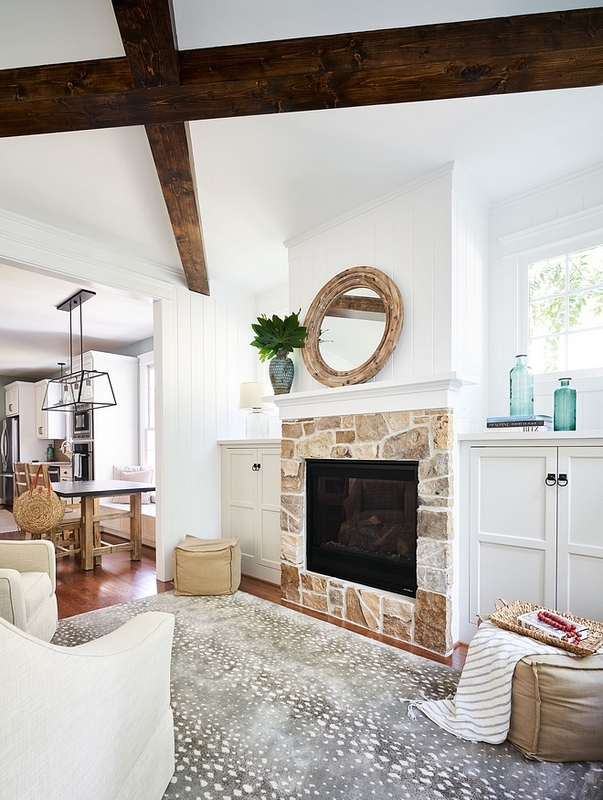 The fireplace features natural Flagstone. 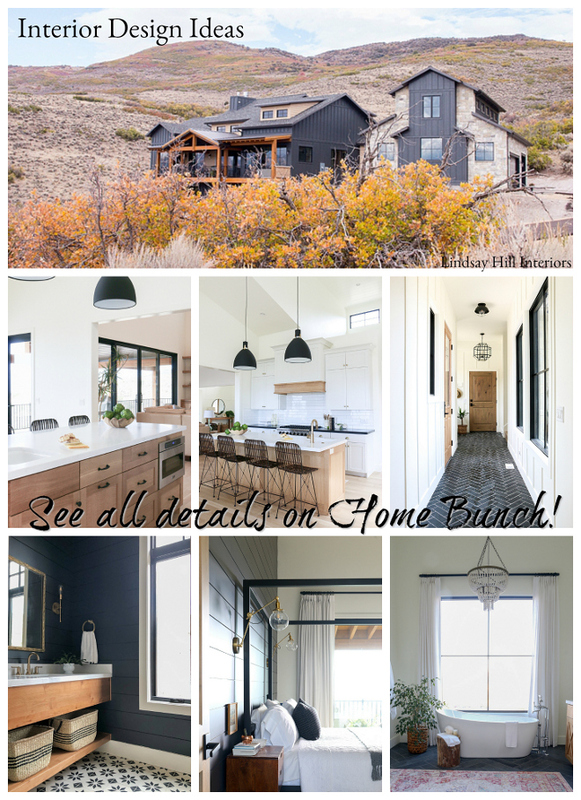 Cabinetry is by Craftsman Cabinetry and Woodworking, Inc. Artesia Cabinets. Table Lamps: Here & Here. 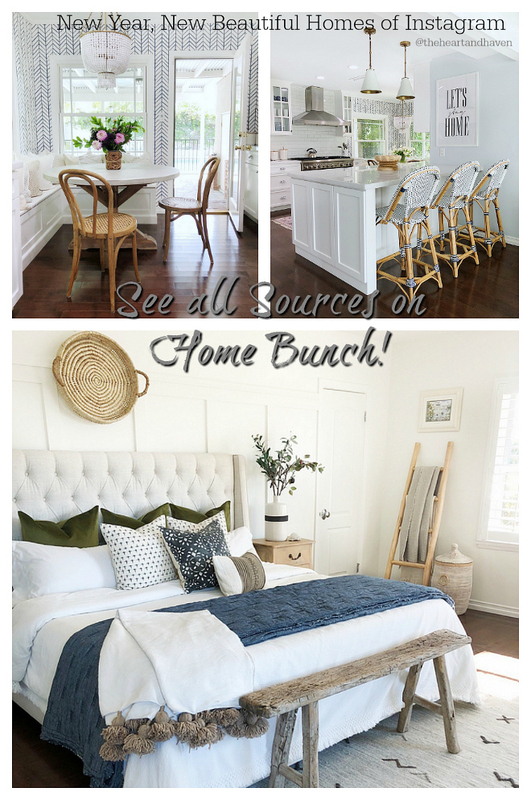 Cabinet Hardware: Here – similar. Beautiful Round Mirrors: here, here, here, here, here, here, here & here. 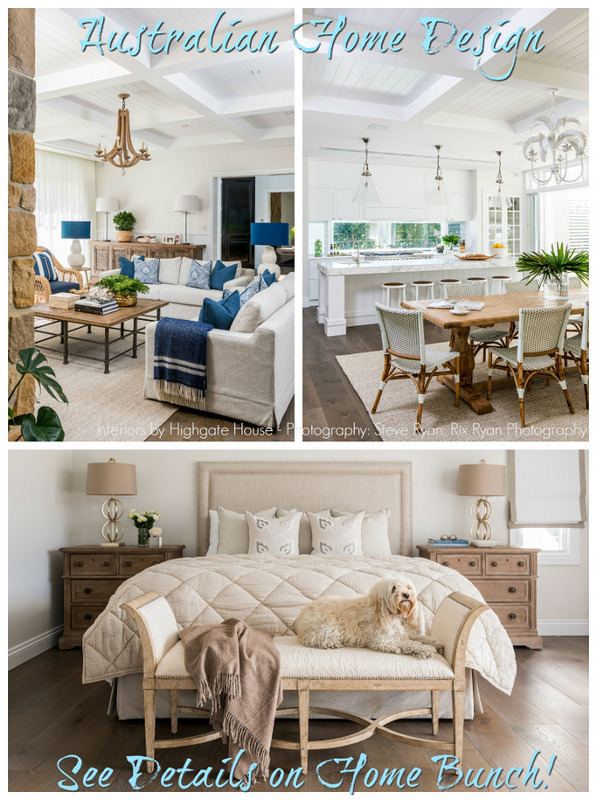 Ceiling, Walls & That Rug! 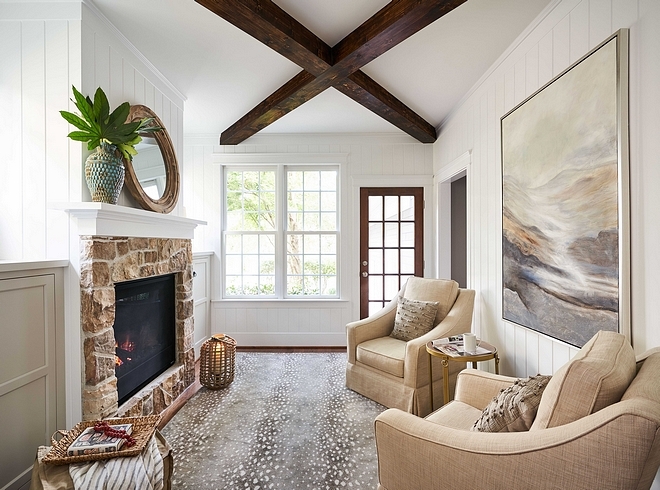 Beams are stained to match existing exterior door with a satin finish, built with 1×6 and 1×8 pine boards. Walls are vertical v-groove MDF Paneling with 1×8 baseboard, and 1×6 cap at the ceiling. Rug: Stark Carpet – Also available in “Almond“. Similar Floor Lantern: here & here. Beautiful Accent Tables: here, here, here, here, here & here. 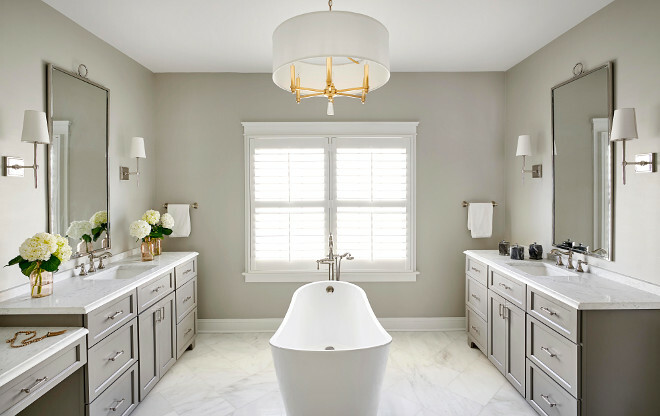 The master bathroom was completely renovated and reconfigured. It is now very serene, elegant and it features an inspiring layout. 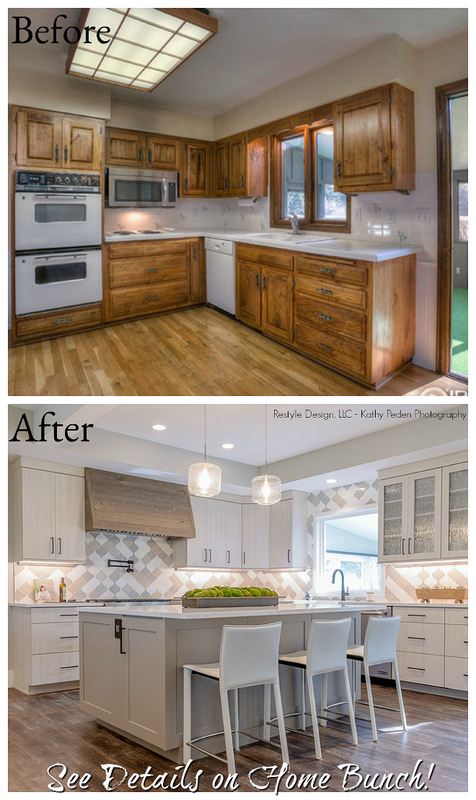 Cabinetry is Craftsman Cabinetry and Woodworking, Inc., Artesia, and they are painted in Sherwin Williams Dovetail SW 7018. Chandelier: Capital Lighting Milan Chandelier. 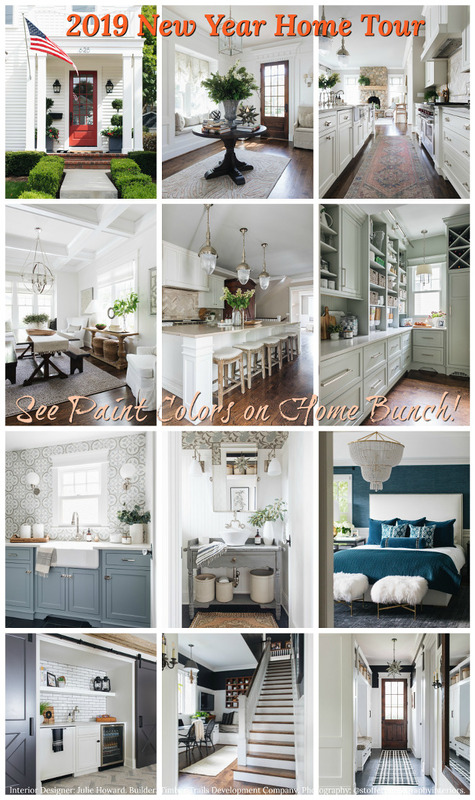 Wall Paint Color: “Sherwin Williams SW 7015 Repose Gray”. 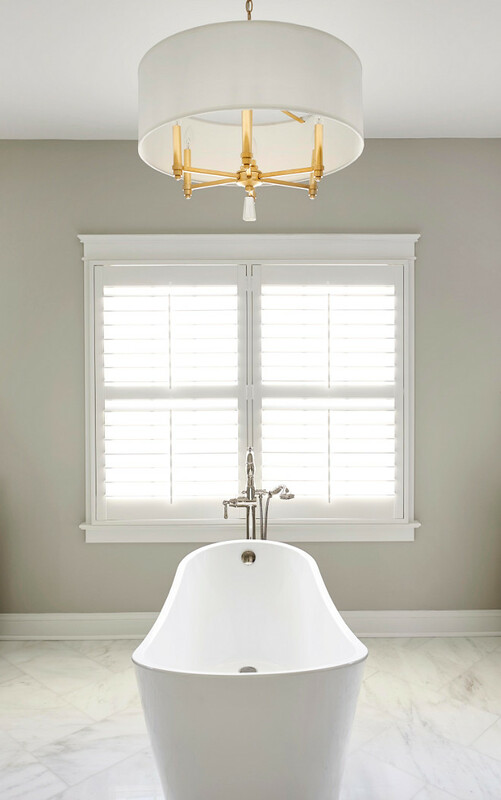 Tub: Barclay Tub in White. Tub Filler: Delta Floor Mount Tub Filler. Countertop is Carrara White Extra Honed – Edge Detail is Dupont with 2” Backsplash. How stunning!!! Faucet: Delta Widespread Lavatory Faucet in Polished Nickel. 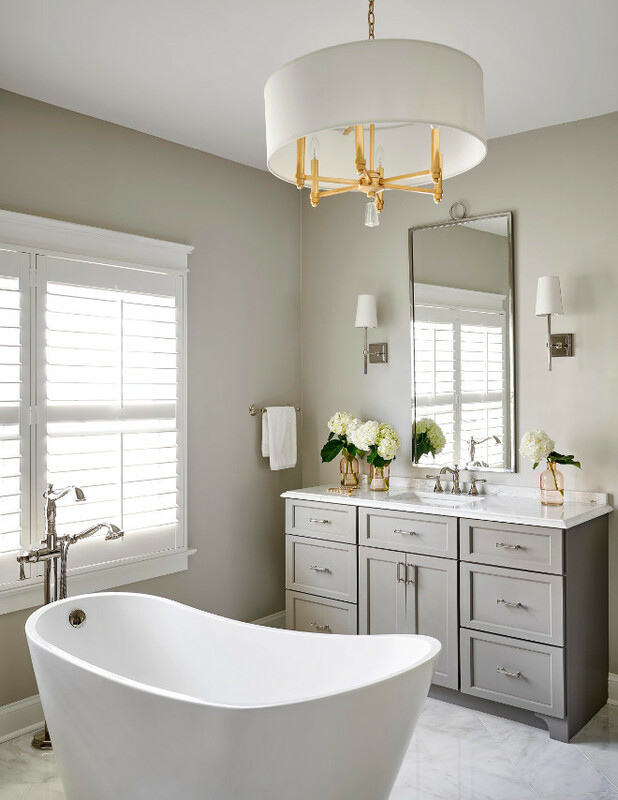 Sconces: Pottery Barn in Polished Nickel. 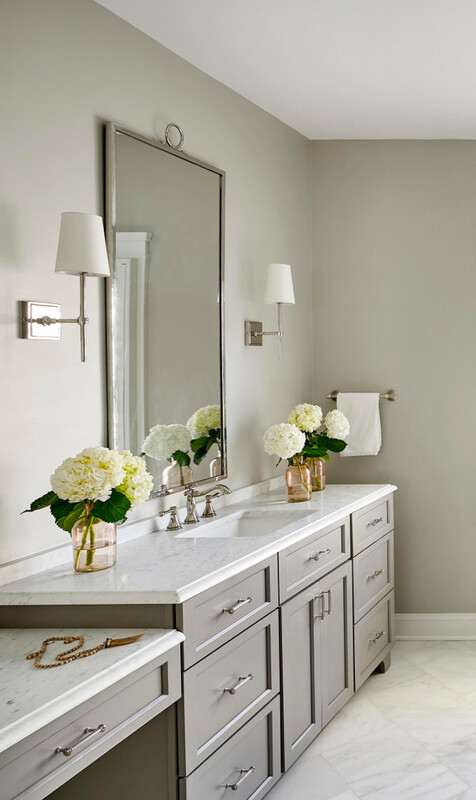 Bath Accessories: Delta Cassidy – Polished Nickel (Toilet Tissue Holder, 12” Towel Bar, 24” Towel Bar, Robe Hook). Shower Tiling: Walls: 12×24 Carrera (in a brick lay) with Bright White Grout. Upper Wall: Carrera Mosaic (similar here & here) with Bright White Grout Upper and Lower Wall separated by a Carrera Chair Rail. 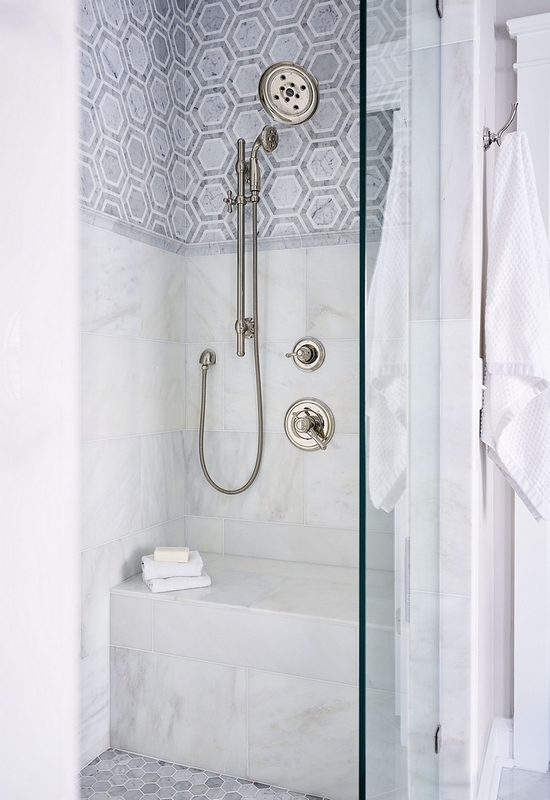 Plumbing: Delta Wall Mount Multichoice Shower Trim, Delta 3 Function Diverter Volume Control Valve & Delta 4 Function Slide Bar Hand shower – All in Polished Nickel. 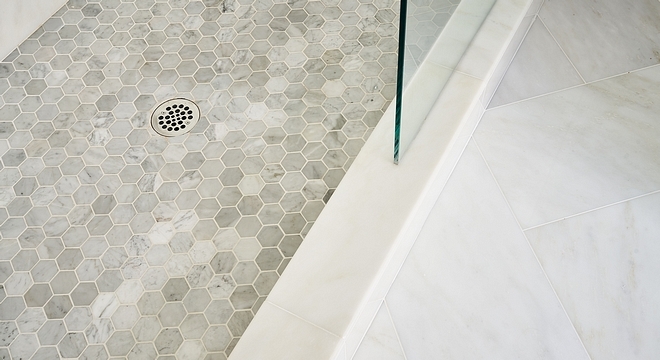 Pan is 3” Marble Hexagon tile with Bright White Grout Lower. 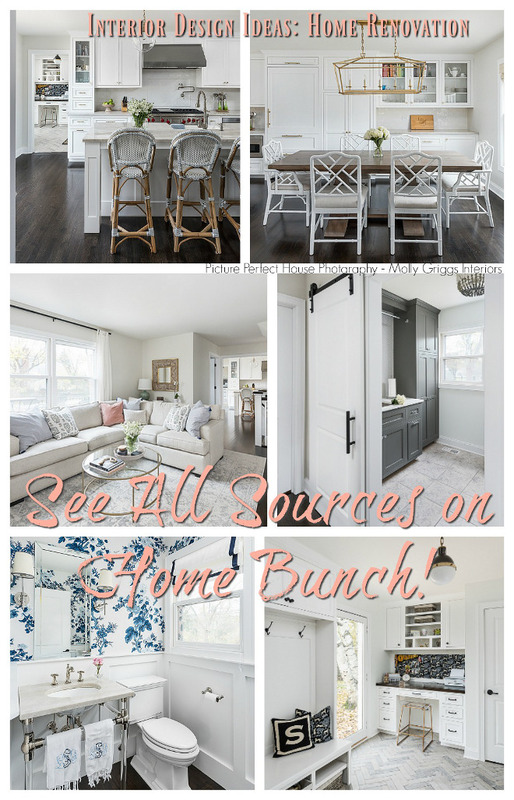 I hope these ideas and sources help you when designing and improving your own home. Have a great day, my friends! 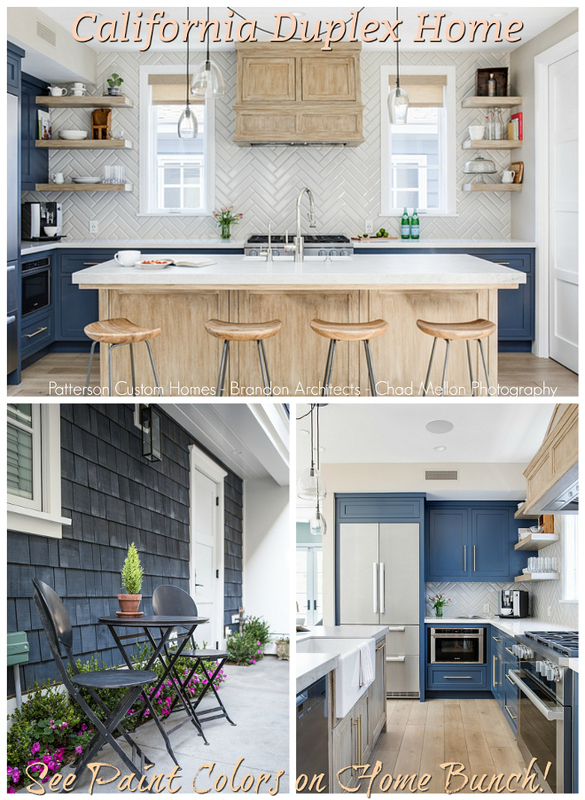 Builder/Design: New Old, LLC – (Instagram – Facebook).